1. Pounce Electric Blue and Electric Purple Radiant Neon ink onto the craft mat. 2. Spritz the inks with Frost Sheer Shimmer Mist. 3. 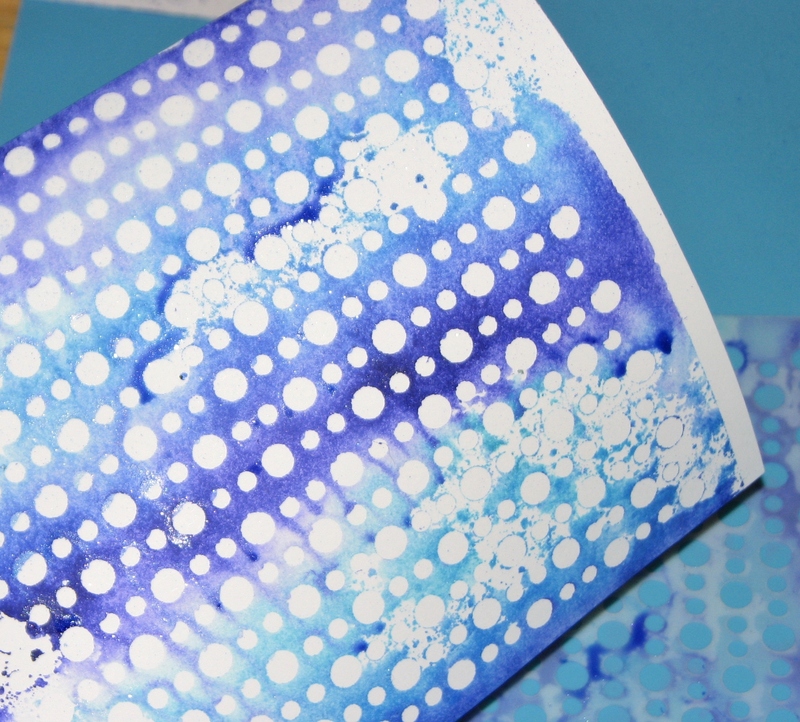 Press a piece of cardstock into the mix creating a bright and sparklie mono print. 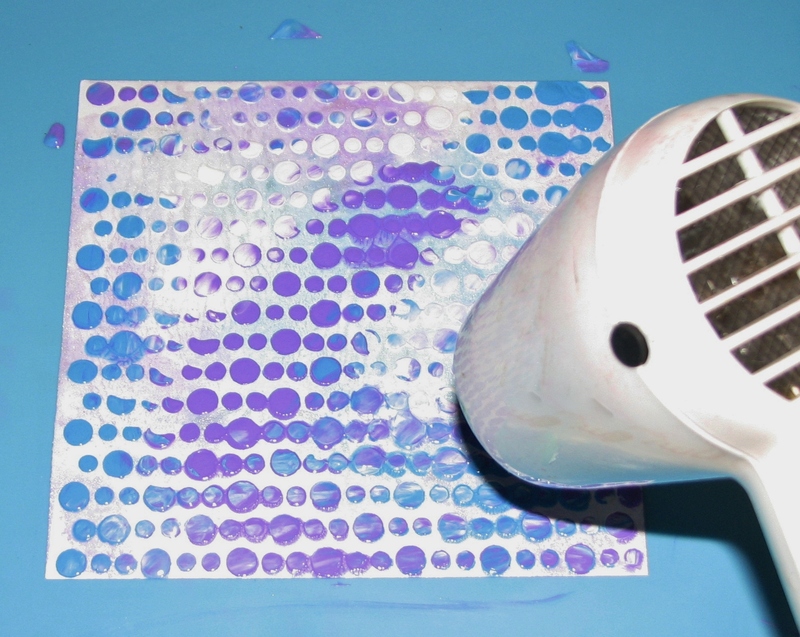 Allow the print to dry naturally or speed drying using a heat tool. 4. 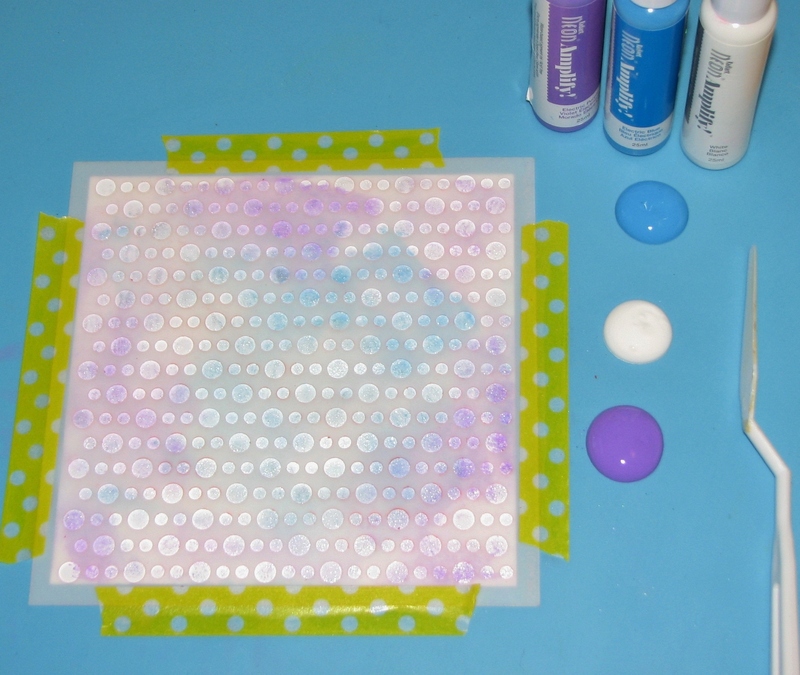 Tape the mono print and desired stencil down on the craft mat using washi or painters tape. 5. 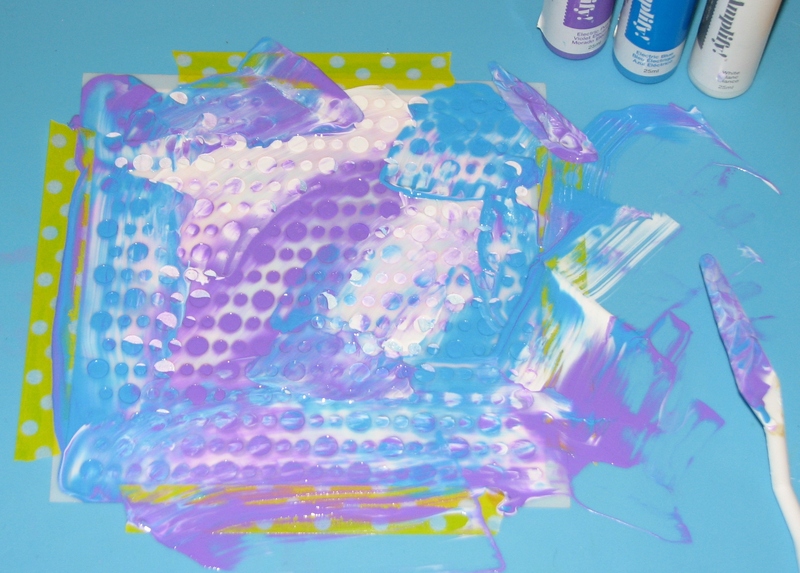 Spread Electric Blue, Electric Purple and White Radiant Neon Amplify medium over the entire piece using the Trowel Palette Knife. The various colors can be mixed to create a fun look. 6. 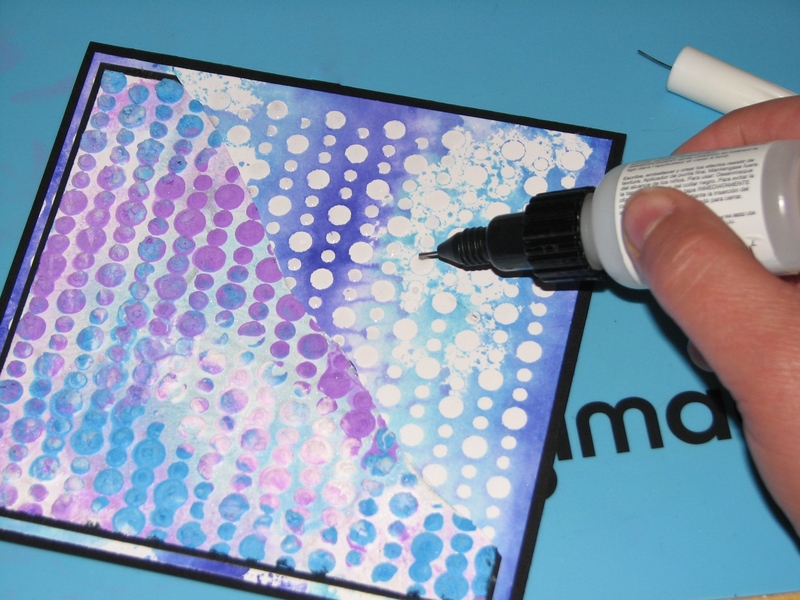 Carefully remove the stencil and wash immediately to remove any excess Amplify medium from the stencil. 7. Apply heat to the Amplify medium to activate and puff. You’ll be left with a fun and funky dimensional textured piece. 8. 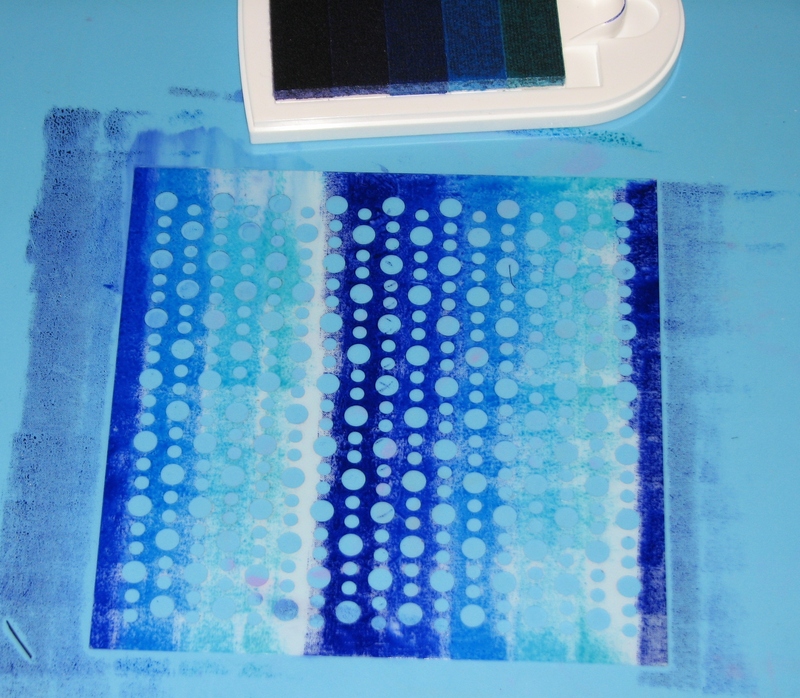 Place the same stencil on the craft mat; rub the Blue Breeze Kaleidacolor ink pad over the stencil. 9. 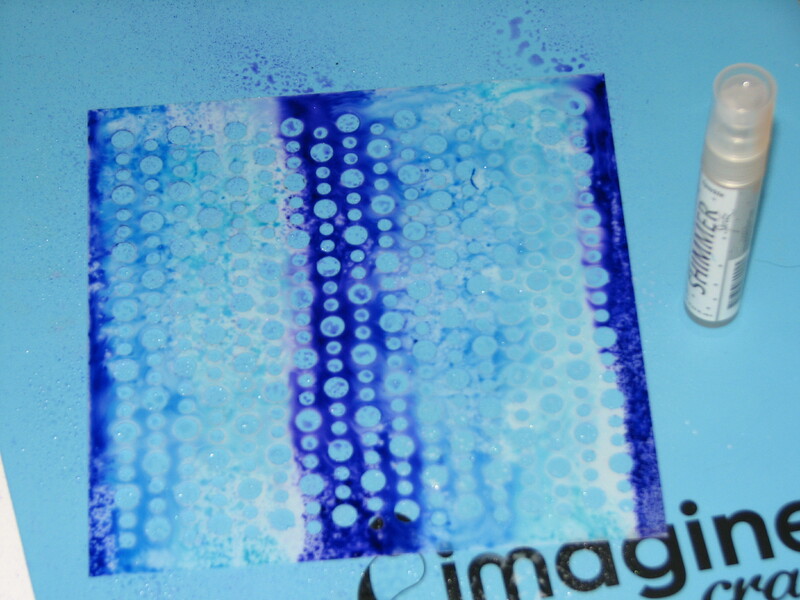 Spritz the inked stencil with Frost Sheer Shimmer Mist. 10. 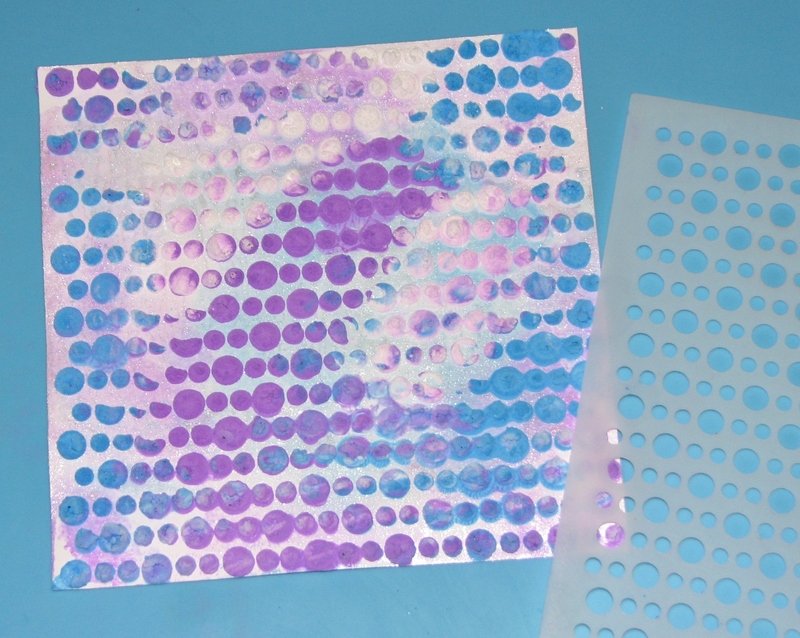 Press a piece of white cardstock onto the inked stencil then peel the cardstock off the stencil to reveal the fun print. Set aside to dry. 11. Color desired image with Memento Dual Tip Markers. 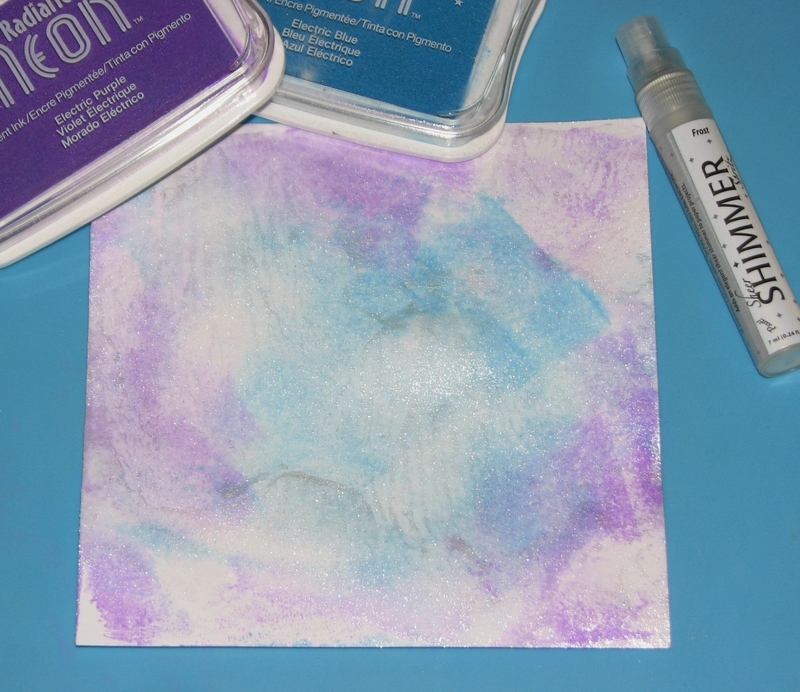 Gently use your breath to blow onto the inked image and stamp onto white cardstock. Trim and mat on black cardstock. 12. 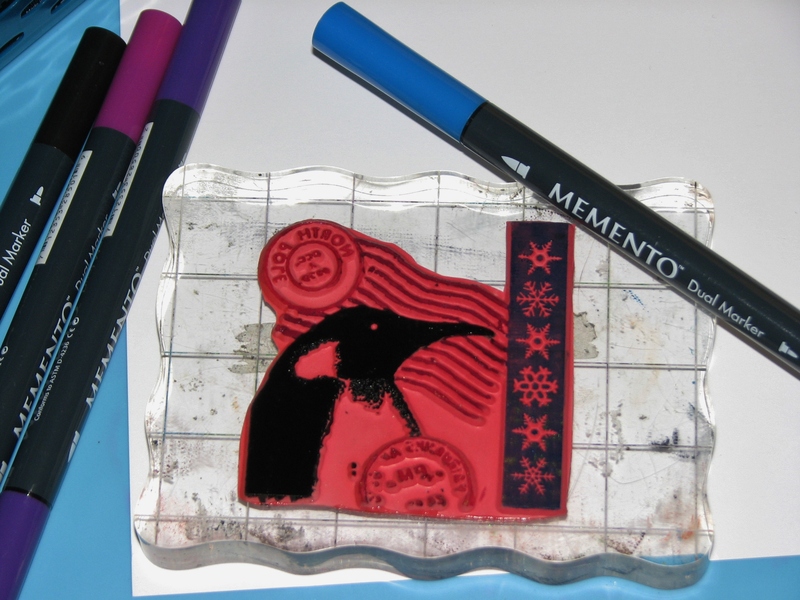 Apply Tuxedo Black irRESISTible Pico Embellisher to the penguin image and set aside to dry. 13. 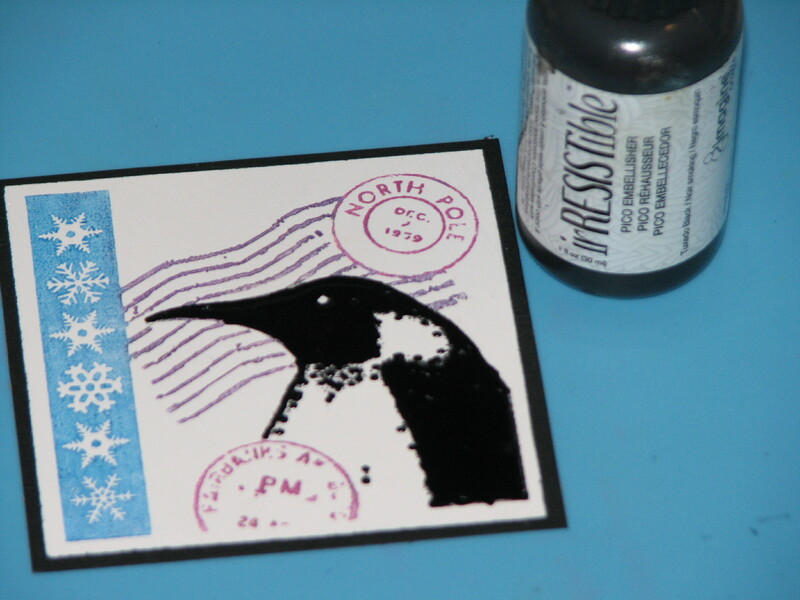 Assemble the card by trimming and mounting the stencil monoprint onto a 6×6 black card blank. 14. 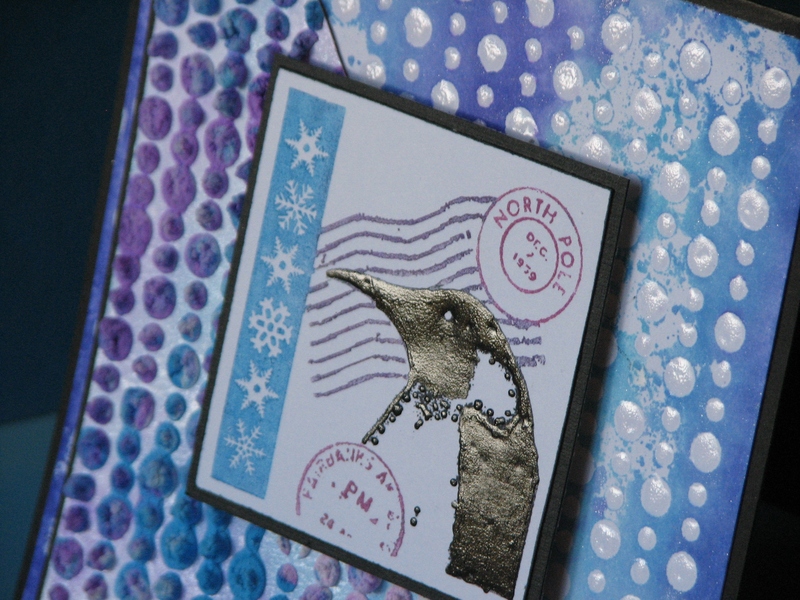 Tear a portion of the Amplify texture print and mat with black cardstock; mount on the card base. 15. Add another layer of dimension by filling in each white dot on the background with Sparkle irRESISTible Pico Embellisher. 16. 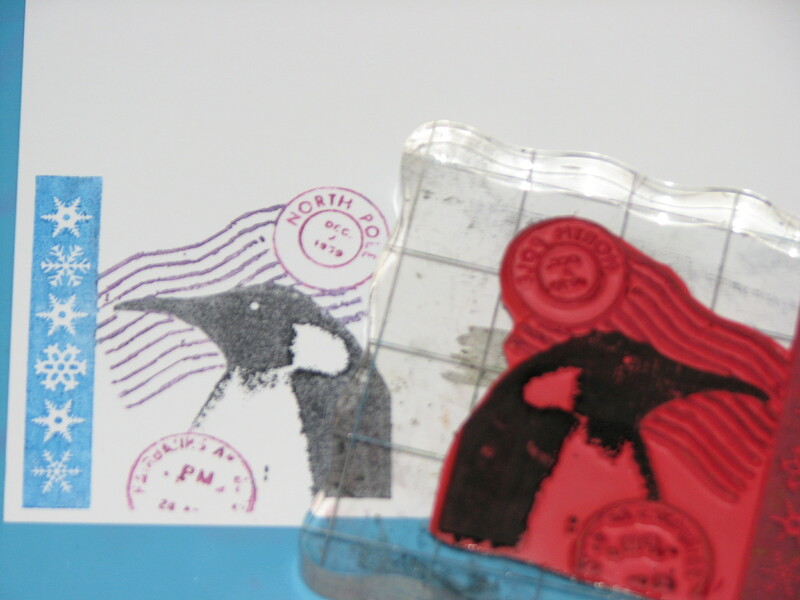 When the background is dry, mount the penguin image onto the card. Enjoy and admire the amazing dimension.